It is a well known fact that Stepper motors are awesome! The only downside is that they can be a bit trickier to get going than servos and plain old DC motors. If you are interested in the inner mechanics and theory of stepper motors, check this excellent post on PCB heaven. If you happen to have one of the cheap little 28BYJ-48 steppers with 5 wires and a little driver board with them, check this tutorial instead. Here, I will focus on how to get a bipolar stepper motor (typically 4 wires) working with Arduino and a H-Bridge IC like the L293D , or the drop in improved replacement – SN754410NE . If you have some documentation about your motor than you are set. All we need here is to see how the 4 wires coming out of your bipolar stepper motor are paired in the internal wingdings. If you got your motor from a mystery eBay special, or from an old printer, then you need to do some testing with a multimeter. Once you figure out how your stepper is wired, remember the colours of the 4 wires, or mark them. Even if your stepping motor has 6 wires, you can still control it like a four wire stepper motor, you just need to identify the center tap wires. You can do that following the same tutorial on stepper motor wiring mentioned above. Once you figure out the two center taps, you can simply mark them and ignore them, as you will leave them disconnected, focusing on the remaining 4 wires instead. 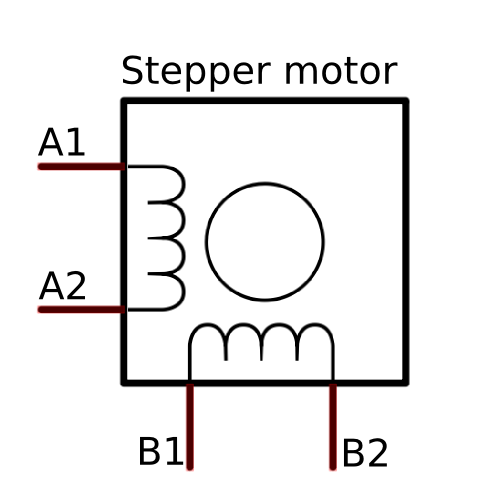 Bipolar stepper motors require a bit more complex electronic control circuit than unipolar steppers, like the 28BYJ-48. You need to be able to reverse the current in the two coils A1A2 and B1B2, much like reversing the current across a DC motor to get it to spin forward and backwards. The easiest way to do that is with an H-Bridge IC, like the L293D ( datasheet ), or the SN754410NE ( datasheet ). You will also need a prototype board, some hook-up wires, an Arduino Uno, or compatible mocrocontroller, a computer with the Arduino IDE loaded and of course, a stepper motor. Both Enable pins on the H-Bridge are connected to 5v (always enabled). 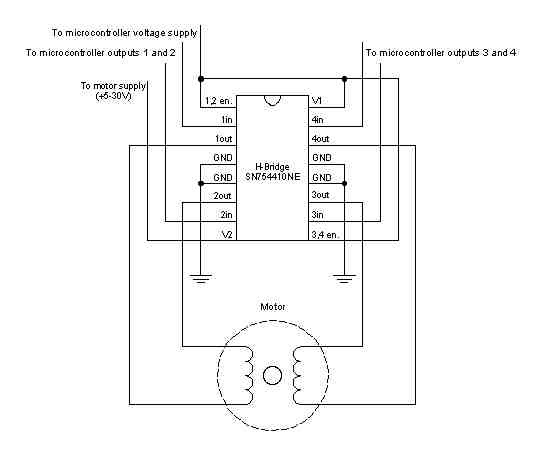 Note that stepper motors can draw significantly more current than the Arduino 5volt reail can source, so you should get a separate power supply for your motor, and remember to connect all grounds. There are two Arduino libraries that help to manage stepper motors and I will cover both in the examples below, but first I like to test out my set up with some basic Arduino code. This will not be an efficient way to drive the motor, but is a good way to get started and get a feel of what it takes to spin the stepper motor. There are two Arduino libraries that help to manage stepper motors and I will cover both in the examples below, but first I like to test out my set up with some basic Arduino code. This will not be an efficient way to drive the motor, but is a good way to get started and get a feel of what it takes to spin the stepper motor. The code below should make your stepper move counterclockwise 48 steps and then counterclockwise for 48 steps. It just happens that after some trial and error I figured that my old mystery stepper has 48 steps per rotation. There are many ways to improve the code above, for example you can make it non-blocking by eliminating the delay function, or create a function for cockwise / counter-clockwise rotation etc. This is what is good about starting with no pre-defined libraries: you are in full control and can experiment and learn in the process. The Arduino IDE comes with a pre-installed Stepper library that does a decent job controlling a stepper motor for basic applications. The example below uses the stepper_OneStepAtATime example sketch (File->Examples->Stepper->stepper_OneStepAtATime) to move my stepper one full rotation clockwise, one step at a time, while pausing between steps and printing the step number to the console. pins. If wired correctly, all steps should be in the same direction. example to see if you got it right. Once you have covered the basics and are ready to try and push your stepper motor to the limit, you can look into the AccelStepper library. This library provides additional features and optimized, non-blocking code for controlling multiple steppers at the same time. This library does not come pre-installed with the Arduino IDE, so you need to download the zip file and install it (Sketch -> Import Library… and select the zip file downloaded from the link above.). The example below uses the library to gradually accelerate my stepper motor over 12,000 steps, then decelerate it back and repeat the process in the opposite direction. Would it be possible for you to include a COMPLETE SCHEMATIC, showing all connections to motor, H-Bridge, Arduino, and power supply. I would feel much more comfortable making a construction with such plans to work from. So does it mean that the driver used for controlling the 28byj-48 stepper (example: 28BYJ-48 STEPPER MOTOR) is also just a simple h-bridge or am I missing something? HI Mark, if you refer to the uln2003 driver, no it is not an H-birdge. The Uln2003 is a high voltage, high current Darlington transistor. I needed the first example for an a 3d art project. I can insert it in my own code and manipulate it better the other examples. they interrupt my timing too much. if i ever finish the project(LOL) , I’ll post it here. I am a noob who just bought an Arduino UNO R3, a CNC shield, and 3 Pololu drivers. All the motor drive programs I have seen for the CNC shield use g-code, which is not what I need. I need to drive 3 stepper motors on a microscope real time and would like to know where I can find a program that has the pinouts correct for a CNC shield, written in standard Arduino language. is possible contoling by serial port 2 stepper , example send serial port 50,100 where 50 steps for motor1 and 100 for motor2?